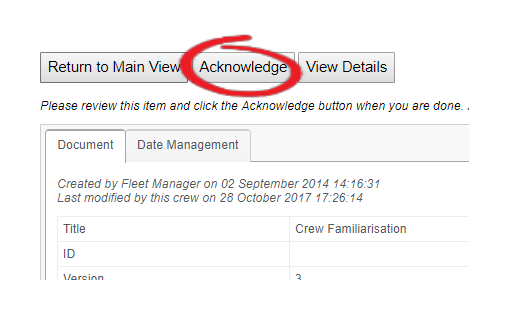 As we mentioned in a previous section, alerts form a fundamental part of Manage My Vessel. This section shows you how see the alerts you have received and how to deal with them. 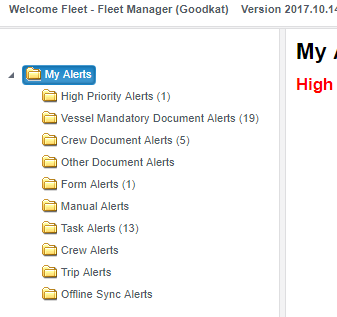 From the Fleet account menu you can click on 'Alerts' - 'My Alerts' to see all the active alerts that have been assigned to you. 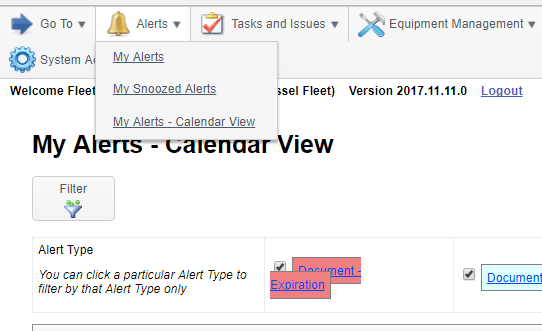 The alerts are grouped into a folder structure on the left hand side of the page, with each folder showing you how many alerts of each type there are. 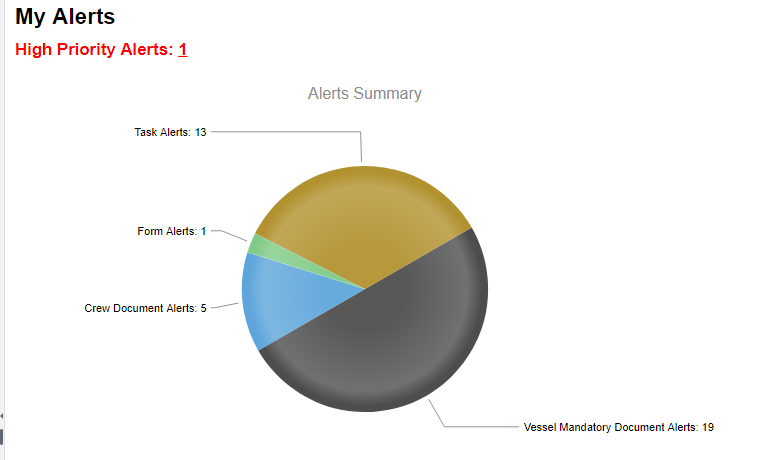 There is also a summary page showing you the percentage of each type of alert. You can click on the chart to be taken to the specific alerts folder. You will also have a bar chart showing number of alerts by Sub Account. You can click on a bar to be taken to the alerts page for that sub account. 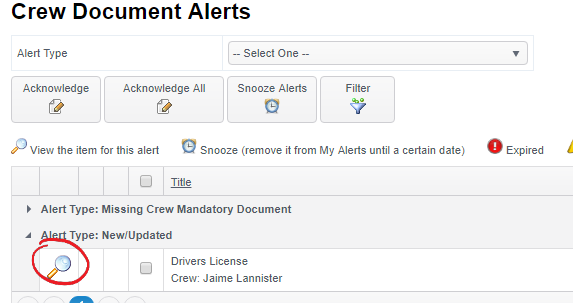 New/Updated alerts can be received in relation to many items such as documents or manuals. Whichever part of the system the alert comes from you will deal with it in the same way. 1. You can update the item to remove the alert. 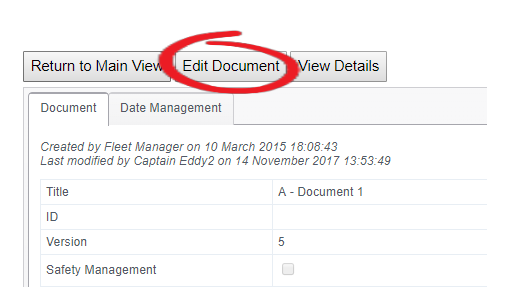 To remove missing document alerts you will need to add a document to the system. To save space on the alerts page, all similar missing documents are grouped into a single line. 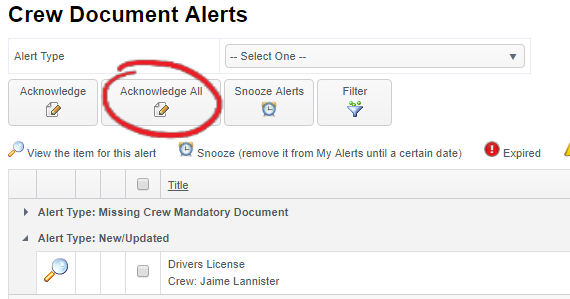 Under each tab you can acknowledge all alerts by clicking the 'Acknowledge All Alerts' button at the top of each tab. This will acknowledge all New/Updated alerts, or in the case of forms, all alerts that have acknowledge enabled. Please note you snooze you can only snooze until the closest expiration/ survey due date. 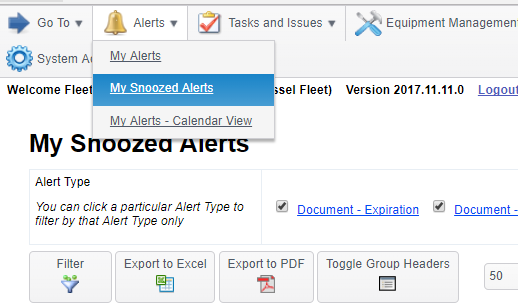 To see all snoozed alerts go to 'Alerts' - 'My Snoozed Alerts'.